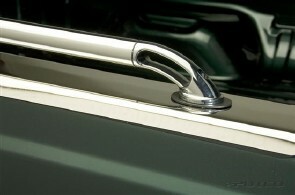 Putco's custom fitted bed rails, that do not require any drilling to install on your truck*. The stainless steel models are made of NeveRust™ stainless steel tubing and come with the highest quality chrome plated zinc die cast stanchions. Thes ends offer a tie down location to hold loads in the truck and, when properly installed, have a capacity of 1000 lb. tie down capacity per stanchion. Each stanchion has 1000 lbs. of Tie-Down strength! No-Drill installation - Mounts into existing stake bed pockets!